It was a hurriedly organized citizen's meeting at Guwahati Press Club, where serious concerns were expressed at the increasing trend of poaching and killing of wildlife in various parts of Assam. The meeting that took place on December 30 urged the Assam government to activate the forest department and its public relation wing to fight against the superstition involving various wildlife parts. Attended by a number wildlife and environment activists, the meeting also appealed to the government to enlighten the police personnel on wildlife issues as well. Various speakers raised voice against the killing of tigers in the region. Tiger is the national animal of India, which gives shelter to half the world's tiger population. Most recently, a tiger was killed by the villagers in Goreswar of central Assam and some villagers even took away its flesh for eating. The incident , which took place in the last week of December, shook the conscience of the conservationists in particular and common people in general, as tiger meat is not recognized a staple food in Assamese society. Earlier in a tragic incident, a full-grown tigress was killed by the Assam police personnel in the first week of December nearby Kaziranga National Park locality. It fell victim of nearly 14 shots from two AK-47 rifles operated by Assam Police Battalion personnel after the inmate of Kaziranga came out to an adjacent village named Bochagaon and targeted few villagers. The State Forest Minister Rockybul Hussain had ordered an inquiry into the incident. Initiated by activist-journalist Mubina Akhter, the press club meeting was attended and addressed by Soumyadeep Datta of Nature's Beckon, Bibhab Talukder of Aranyak, Purnima Sarma of Early Birds, Satyaranjan Bora of Seuji Dharani Dhunia with many others. The countrywide census of tiger in January 2008 reveals that India had only 1,411 tigers alive. The number was 3,508 in 1997. In early Nineties, India's population of tigers was recorded as nearly 40,000. Of course, there is some good news that the number of tigers in India is increasing up to 1,875. Assam can take it pride as the State has nearly 15% of India's total tiger population. Five years back, Assam recorded to give shelter to 70 tigers. It has increased the tiger population in 2010 (to over 100). Unfortunately Assam remains a major State where the tiger poaching is going on for many years. Other Indian States which observe rampant poaching of the highly endangered wild animal include West Bengal, Bihar, Uttar Pradesh, Uttaranchal, Rajasthan, Madhya Pradesh, Andhra Pradesh, Maharashtra, Karnataka and Kerala. 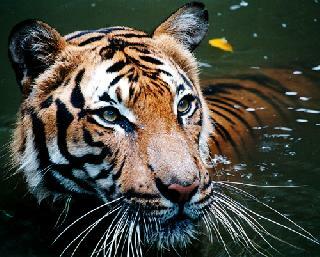 "Tiger and other wildlife are being regularly poached for use in some Chinese traditional medicine. Many times, the superstition among various sections in the society instigates the killing of wildlife. Hence public awareness is the need of the hour," said Soumyadeep Datta. He also criticized the State forest department for its ineffectiveness to make common people a partner in the conservation effort. Datta particularly pointed out that the publicity wing of the State forest department has done a little in this respect. "If a tiger is killed by some villagers and even the flesh is taken for eating, the forest department must take prompt actions against them. More over, its publicity wing should rush immediately to the location to understand the reasons behind this kind behavior of the villagers and pursue for conservation of wildlife in those localities," Datta added. India adopted the Wild Life (Protection) Act, 1972 to prosecute the wildlife criminals. The same year tiger was selected as the national animal of India. The central government launched the Project Tiger scheme next year and upgraded many forest reserves for safeguarding the tigers. Some of the important reserves where tigers should enjoy sanctuary include Manas National Park, Kaziranga National Park, Namdapha National Park, Nameri National Park (all in Assam), Packey Wildlife Sanctuary (Arunachal Pradesh), Dampa Wildlife Sanctuary (Mizoram) with Sunderban National Park, Corbett National Park, Kanha National Park, Sariska National Park, Pench Tiger Reserve, Tadoba Tiger Reserve, Periyar Tiger Reserve etc. "We have a number of wildlife protection rules but at the same time we need to sensitize the forest officials. The people living in the adjacent areas to wildlife reserves should also be enlightened on the process of conservation," said Bibhab Talukder. He appeals every one to take a pledge in the new year to preserve the wildlife and the environment. Talukder argued that even being pro-people, we could be active conservationists. Both Purnima Sarma and Satyaranjan Bora emphasized on the community involvement in the mission to preserve nature and conserve wildlife. They also insisted that the government and forest department must play a pro-active role. Citing the example of Kaziranga tiger killing incident, Mubina Akhter in her speech expressed anger that the authority has not taken any visible actions against the responsible police personnel who was involved in the killing of the tigress near the 430 square kilometer UNESCO World Heritage Site. She advocated that a group of dedicated reporters should be trained on environment and wildlife issues. Regular interaction among themselves through a network and sufficient space for the issue in the mainstream newspaper and news channels were also emphasized in her speech.